Welcome to the ProFantasy community forum! The purpose of this community is to ask questions, share tricks, and generally learn how to use ProFantasy products. Current patches and tech support are available from the ProFantasy website. This topic provides general forum guidelines, as well as detailed explanations for how to post your images (maps) in this forum. Please read, there are several tips here you may find useful. Because our users make up a very active community, some guidelines have been put forth to keep the forum running smoothly and on topic. Please be civil and polite in your postings. We are a friendly bunch of people here, and we'd like to keep it that way. If someone posts something you personally do not agree with, use the "Whisper" function to talk to them directly. Be aware that moderators can see "Whispered" posts. Try to stay on topic. A little conversation mixed in with software related messages is acceptable, but please don't stray too far off-topic. Respect moderators closing a topic, if they decide it to be irrelevant. Attachments are possible on the forum. Please see below for how to post images and source files of your maps. Please try to avoid "Me too" postings. If you agree with someone, that's great; but put some other information in the message as well. In many cases, the answer to your question is already available. The forum is fully searchable, so before you post a question, please click on the "Search" tab above and try whether a few keywords relating to your question bring up an answer. No "Virus Warning," "Help A Sick Child," or any of their ilk. Please keep this spam to yourself. No advertising for sites or products that do not directly relate to ProFantasy. Please keep images in posts to 1024 pixels wide or less. this increase readability for all, and reduces bandwidth costs for those with limits. Link to external images for hi-resolution versions. See 'Posting your maps' below for details. Please DON'T use whispers to admins/mods/knowledgeable people to ask for help unless you need to convey sensitive information. Post in the open, that benefits everyone else who might have the same problem, and it helps you get an answer quicker, because there are more than one person who can reply. If you prefer a mailing list format to participate in the ProFantasy community, you can subscribe to the CC2-l Yahoo group. We're trying not to bog anyone down with rules, but some order must be maintained. If you have any questions, please don't hesitate to e-mail us. The ProFantasy community forum allows users to upload images and other attachments limited to a size of 1024kb or lower. This should be plenty for most maps. You can upload images (.png, .jpg), maps (.fcw), symbol catalogs (.fsc), and templates (.fct) directly, but you can also use software to create compressed files (.zip, .rar) and attach those. Images attached to a post will be displayed inline, and should be resized to be a maximum of 1024 pixel wide before posting. This limit of a width 1024 have several reasons. First of all, not everyone have the fastest connection, and may even have data limits. Images shouldn't be a strain on the visitors resources unless said visitor actively clicks a link to see a higher resolution image. Secondly, not everyone have the highest resolution screens. And if the visitor have to scroll to view your map, it is difficult to appreciate the whole. Viewing a too-high resolution map is just as bad as viewing one with too low a resolution. So, please stick with images no wider than 1024 pixels for inline display in the post, no matter if it is an attachment or an externally linked image, and instead provide a link the visitor can click to see a higher resolution version. Note that this usually requires you to have two versions of your image on the image hosting service, one smaller for embedding in a post according to the above guidelines, and one larger hi-res version you can link to. If you want to post larger images of your work, please use an external server for hosting the images. There are a number of free services available on the web, like Flickr, PhotoBucket, or ImageShack. Most cloud storage solutions also lets you make an image public and link to it. Note that you should still stick to 1024 pixel wide for images displayed inside posts, but such services are great for providing alternate hi-resolution images you can link to. Posting an image as an attachment is the easiest way. When creating a new post, there is a browse button below the comment field that allows you to browse to a file on your computer. This will be added to the bottom of your post. Note that to add additional attachments to a single post, post it first with a single attachment, then hit the Edit link in the top right corner of the post, and you will be able to add another. You can also delete existing attachments this way, for example to replace it with an updated version. Note that using attachments are recommended, because they will always be here for as along as this forum operates. External image hosting sites may disappear, or change their URL's, causing links to stop working and as a result, images to not show up in your post. If you wish to link to a higher-resolution image, that will need to be on an external site, but having the inline image as an attachment is preferred. If you wish, you can also include an image frorm an external source, like the image hosting providers listed above, or anywhere else on the net (if you have a server for your personal webpages for example). First of all, to be able to do this, you need the URL (address) pointing to the actual image. Many hosting services will often provide an URL that goes to a page at their server holding the image (often with ads), and such a page cannot be embedded in your post, you need the link to the actual image. Most providers will have this somewhere, but do note that not all providers allow embedding on external websites. You should be able to test the URL by pasting it into the address bar of your browser. If the browser loads up your image and nothing else, the URL is probably fine, but if it appears embedded in the pages of your image hosting provider, it is not usable. Ask your hosting provider if you are unsure how to get an image URL. Some image hosting services will give you the BBCode needed to include the image in a forum post. If your service does this and you prefer to, you can instead set the 'Format comments as' below the comment input box is to 'BBCode', and simply paste this code into your post where the image should appear. Click for <a href="http://www.flickr.com/photos/76364916@N00/2299437761/">Hi-res<;/a> version. Now, if you follow the forum guidelines and post a smaller image embedded in the forum post, you can link this to a high-resolution version for those that want to examine it in more detail. This can be done with a link on the image itself, so that if you click the image, you are taken to the high-resolution version, or it may be a simple text link accompanying the image. To do this, you need to place the link around you image code. Note the a-tags before and after the image (img) tag. This is what creates the link. Again, remember to do this exactly as written above, it won't work if you have any mistakes. Every ", <, > and / are important and needs to be in the correct place. If your image is an attachment, or you don't want the link on the image itself, you can also create a text link. To do this, you only need the link-tags (a) and some explanatory text. This is very helpful when you want to link to something else in your post beside an image, such as another post in the forum. You will still need the target URL, either the URL to your hi-res image as discussed above, or to whatever you want to link to. 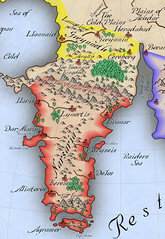 I'll still use http://www.example.com/hires-map.png as the example, replace it with your own. Click for the <a href="http://www.example.com/hires-map.png">high-resolution</a> version. Attachments appear by default at the bottom of your post, but if they are images, you can actually position them where you want them in your post, just as when you include an external image as described above. This is required if you wish to place a clickable link on an image added as an attachment. 1. Make a post with an attachment as usual, and post it. The attachment will appear at the bottom. It is important that this is written exactly as explained here, it should not go inside an img-tag or similar. More about Hyperlinks, provided by forum user Dogtag. I've seen a lot of non-functioning URLs posted in these forums so I thought some people may be unaware of how to make them into "live" links. For those of you who may have been wondering how to do that, here are some pointers. First, make sure that either Html or BBCode is selected, in the Format comments as at the bottom of the page where you type your post. HTML and BBCode handle links differently, so I'll explain each one separately. But first, a word about their similarities. To skip explanations and just see the syntax to use, you can jump to the summary at the end of this post. In both HTML and BBCode, closing tags are typically the same as start tags but include a slash "/" before the tag name. There are exceptions but that is the general rule. Some forums don't allow HTML, which is why BBCode was developed. Also, BBCode tends to be simpler and more limited than HTML. Here in the ProFantasy forums, however, it really just comes down to personal preference. The link tag in HTML is called the anchor tag, which is written as <a>linked text</a>. However, in HTML, we need to add additional information, such as where we want to jump when a user clicks the link. Extra information that you add to an HTML tag is called an attribute. There are several different attributes for different HTML tags, but the main one we want to concern ourselves with is the href, or hypertext reference, attribute. The word <a href="http://www.profantasy.com">ProFantasy</a> in this sentence is a link to the ProFantasy site home page, http://www.profantasy.com. The URL for ProFantasy is <a href="http://www.profantasy.com">http://www.profantasy.com</a>. The link tag in BBCode is called the URL tag, which is written as [url]linked text[/url]. However, there are some real differences when using the URL tag in BBCode. But if I wanted to link non-URL text, I have to use a slightly different format. To make the word [url=http://www.profantasy.com]ProFantasy[/url] a live link... NOTE: I didn't need quotes around the URL in BBCode. For more info on using HTML in general, visit w3schools.com. They have very easy-to-understand instructions and nifty way to let you experiment with HTML (and other) code right there on their site. For more on BBCode, visit BBCode.org. Some sites have slightly different "flavors" of BBCode but this site does a very nice job of providing samples of typical BBCode.